From the NJ Turnpike, take exit 7 and follow Route 206 south to Route 38 east, to second traffic light, then turn onto Magnolia Road (Route 644). Follow Magnolia Road until you come to the Four-Mile Circle. From the circle take Route 72 east, at mile marker 1 make a left. There is a forest entrance sign on your left as you turn in. Take the first right and the office is on the left. 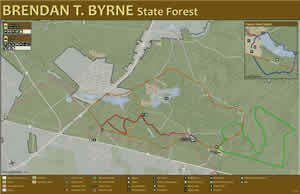 The Brendan T. Byrne State Forest recreational facilities are partially accessible to persons with disabilities. Please contact the park office for further information regarding disability access needs. Text telephone (TT) users, call the New Jersey Relay Service at (800) 852-7899. Office Hours: Open Daily 8:30 a.m. to 4 p.m. Many of the forest communities represented in the New Jersey Pine Barrens may be observed along the trails through the natural area. These include upland pine-oak and oak-pine forest, pitch pine lowland forest and Atlantic white cedar swamp. The natural area supports the federally threatened swamp pink and other endangered plant species. 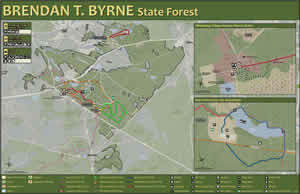 Brendan T. Byrne State Forest has more than 25 miles of marked trails. The various trails and loops provide challenges ranging from long single track hiking trails to a trail accessible for people with disabilities. The Batona Trail is designed for hiking, cross country skiing, and snow shoeing (weather permitting). The Mount Misery Trail allows visitors the additional option of mountain biking, and the Cranberry Trail allows for access by wheelchairs in addition to all the other uses listed above. The Batona Trail is almost 50 miles in length and links Brendan T. Byrne, Wharton, and Bass River State Forests. This portion of the Batona Trail is maintained by the NJ State Park Service and the Batona Hiking Club. 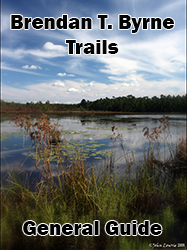 All of the trails allow the visitor to enjoy the scenery and biological diversity of the Pine Barrens. Whether you want to spend an hour or an afternoon hiking - the trails at Brendan Byrne provide unlimited opportunities for fitness and relaxation. Brendan T Byrne State Forest is pleased to announce that our Cabins are available for rent through November 30, 2018. The cabins are available as dry cabins , which means there is no running water or interior bathrooms. Outside portable restroom stalls will be made available at each cabin site. Additionally, the family campground is open year-round with full facilities, including our new shelters that are equipped with wood burning stoves. 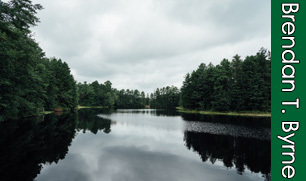 Cabin renters may use the bathhouses located in the family campground for restrooms, running water and hot showers. You may call the Brendan T Byrne office for more details on winter camping. Campsites: 82 tent and trailer sites each with fire rings and picnic tables. Flush toilets, showers and laundry facilities are within walking distance. Oopen year round. Fee: NJ Resident $20 per night; Non Resident $25 per night. Group campsites: Three group sites with fire rings, picnic tables, water, and flush toilets. Each campsite accommodates up to 30 people. Open year round. Fee: NJ Resident $60 per night; Non Resident $120 per night. Cabins: Three cabins with furnished living room with fireplace; outdoor campfire rings; two double-deck bunks; kitchen with running water, electric stove, refrigerator; half-baths with toilet and basin. Electricity. Each accommodates four people. With prior permission from the superintendent, two additional people may be accommodated. Cabins are on the shore of Pakim Pond. Showers are available at camping area. Open March 30 through October 31. Fee: NJ Resident $55 per night; $385 per week; Non Resident $65 per night; $455 per week. Programs are provided by the Pinelands Institute for Natural and Environmental Studies (PINES), (609) 893-1765.